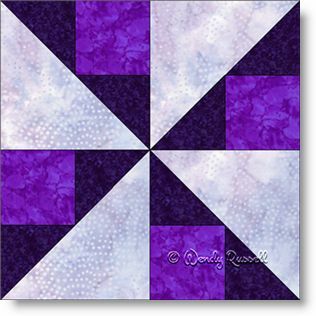 Well of course I had to make the Lilac Lane quilt block in shades of lilac. That is just how predictable I am. This quilt block uses the half square triangle pieces, but this time, it is not to make squares. You add them to existing squares to make a large triangle. This triangle is then sewn to another triangle to make one of the patches. Using four of these identical units in your four patch block is then what gives the appearance of a pinwheel. The quilt samples illustrated give you some ideas of using your blocks in a straight set, or an on point layout, but there are many more variations you can come up with, I am sure.